Taught myself with 16 Foot Aluminum Boat. Had a 65 hp motor that would go about 34 mgh. I only weighted 100lbs so that was fast enough. I'll let you know when I find one. It was the Wichita River Festival. about 1985. I got second in Mens II. I think I got first in jumping. I was so excited to show all my buddies my trophy I spead out to the lake where all my friends were camping out. While en route I got a speeding ticket. It was as if I sprouted wings and had my first flight. Lots of people. But Mike Holt has been the best training partner anyone could ever have. Several silvers. 3 or 4 Team Gold. This last year I won the SR. Mens World Tricks Gold. and finally after many years of trying the Overall Sr. Mens World Championship Gold Medal. The list is too many. But I can tell you I enjoy watching the kids PB's and all the advancements that skiers make. Well for the last Worlds about 5 Times a week for 4 months prior to the comp. 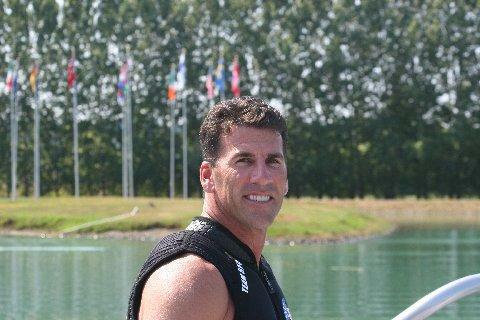 Right now I am recovering from shoulder surgery and don't know if I'll be skiing much anymore. The Dr. told my wife when I was in recovery that it looked like a grenade went off in my shoulder and he didn't know if I should ever ski again. What is your Personal Best Score in Jumping? 72?